I am beyond excited to share that I’ve joined with the 2015 creative team over at Martha Stewart to participate in 12 Months of Martha! What is that, you ask? Each month I will receive a box of Martha Stewart craft products and am asked to create something unique and beautiful. I whole heartedly said, “Yes please!“. 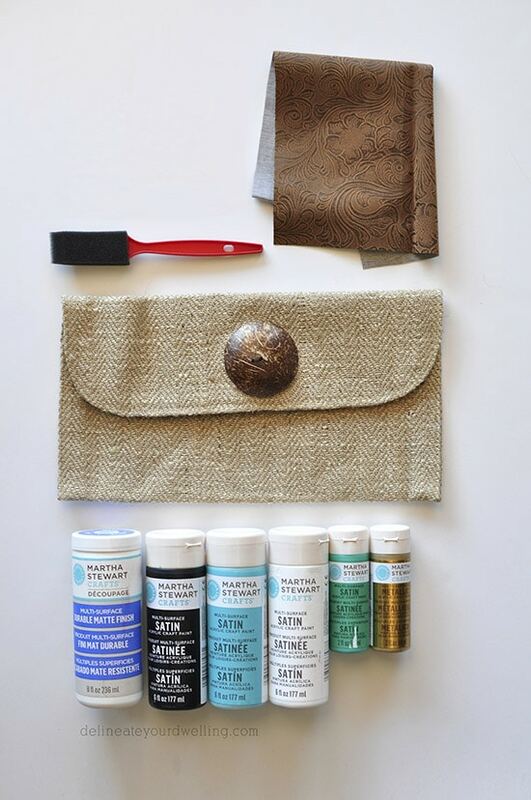 This month I recieved all kinds of fun core crafting products from paints, to decoupage and fringe scissors. 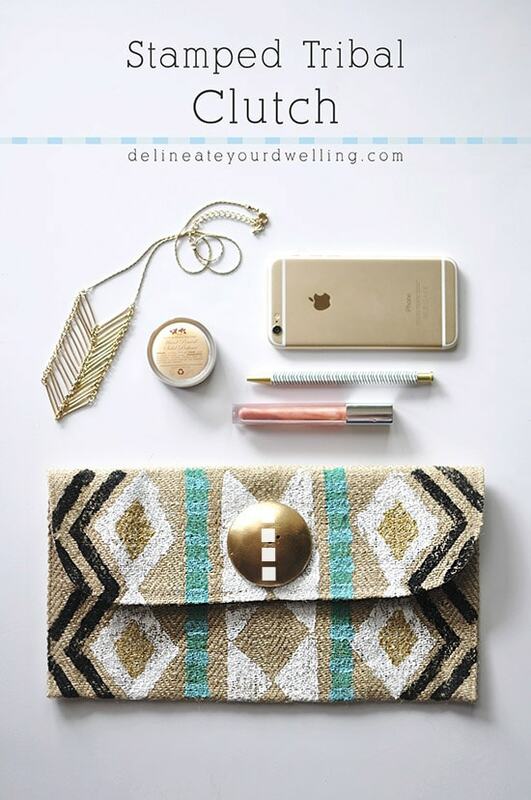 Today I am sharing how I used those products to create a Stamped Tribal Clutch. Using a regular sponge, I cut it into various shapes (triangles, diamonds and narrow lines) to stamp my patterns onto the clutch. 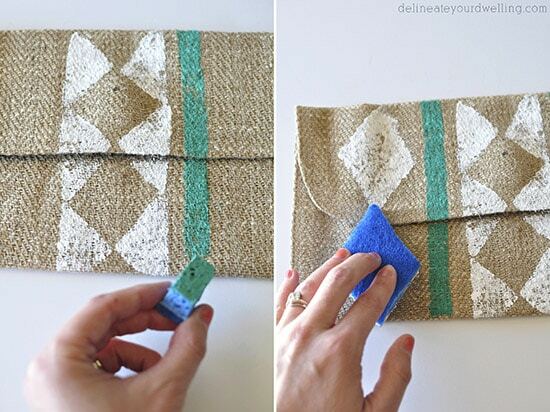 Using a small dollop of Martha Stewart paints, I dipped my sponge into the paint and applied to the burlap. I really loved how smooth and rich the paint came out. I knew for certain that I wanted to cover up the interior of the clutch. It came with a BOLD leopard print and although some ladies can totally rock that, it didn’t work for me. I laid down a section of faux leather fabric and traced the shape of my clutch onto it. I cut out where the magnetic latch was located and then used fabric fusion to secure the faux leather in place. The leather only goes a few inches past the opening, but the fabric fusion should hold it in place perfectly. I love the new leather interior look now. I also spray painted the wooden button gold and added four simple white paper squares using Martha Stewart’s decoupage. 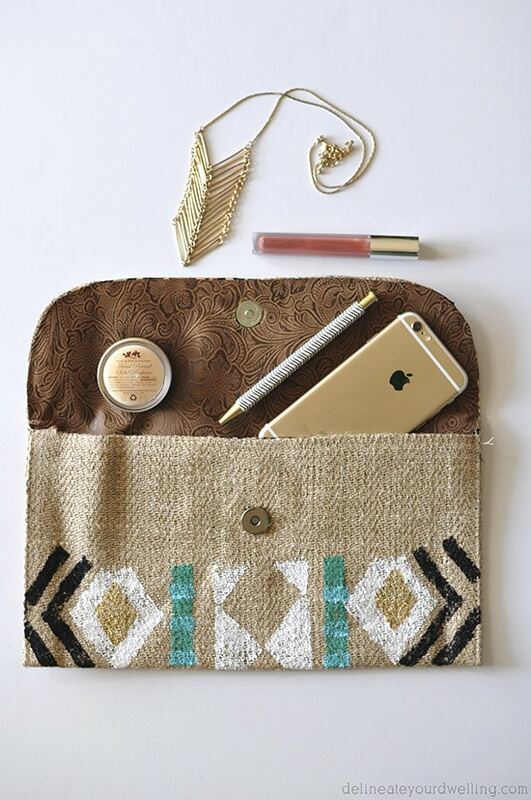 I’m officially in love with this clutch now! 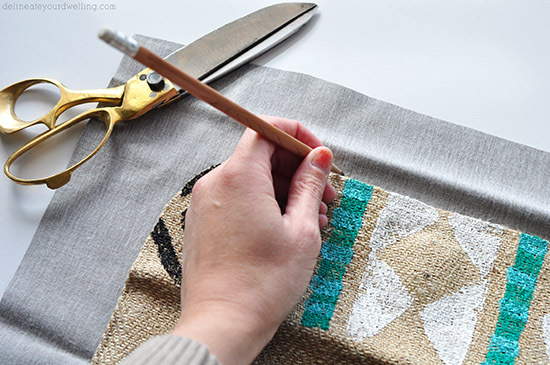 Interested in the other 12 Months of Martha projects I’ve done? Thank you to Martha Stewart for supplying the craft materials used on this project. 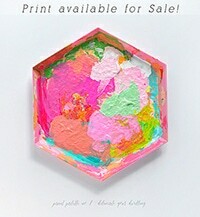 From the brushes to the paints, as you can imagine, Martha sells only the highest quality products and I love them! Fantastic project! 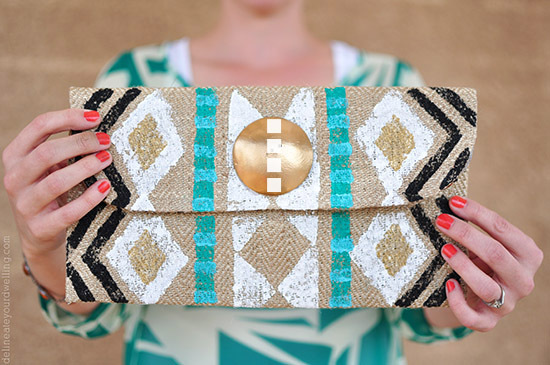 Where did the burlap clutch come from? I’d love to make this or similar for my three daughter-in-loves! Thanks so much, Linda! I got mine last year at Hobby Lobby. These are amazing beautiful ! Amy, I love your creativity! Aw, you are too kind Yasmina!! Thanks for stopping by. Thanks for the invite, Lorelai! I stopped over and shared a few. Have a good weekend! Aw, you’re too kind Amy! Happy Friday, friend. Aw, thanks so much Shannon! Super cute! Thanks for sharing at the Pretty Preppy Party! Oh, thank you for the feature Mandee!! The clutch is awesome but I gotta ask, where is that necklace from? It’s so cute! Thanks so much, Lidia. The necklace is one of my favorites… it’s a few years old from Forever 21! Wow! 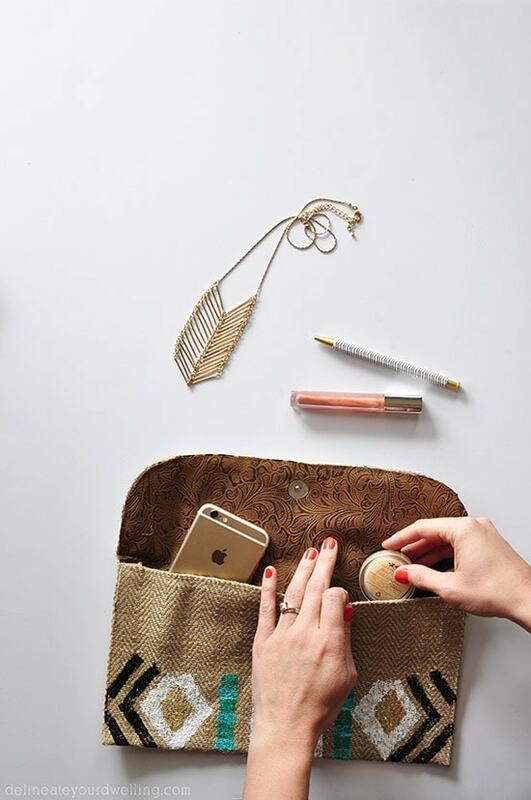 This clutch looks amazing! I love tribal print! Thanks so much, T’onna! 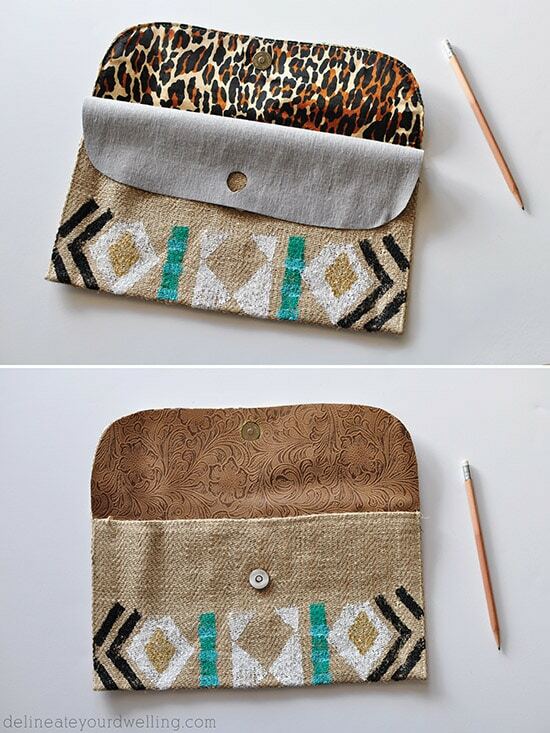 It’s my first tribal pattern project and I’m in love… now I’m ready to cover everything in sight! Thanks, Amanda! I’ve been wanting to try a tribal pattern forever and now I’m so glad I did. Amy, I am absolutely in love with this! So bold and gorgeous! Aw, thanks Brynne! I loved making that clutch!! This is super cool!! Love it! Aw, thanks lady!! It was a fun one to create. I love it, what a great project, and the clutch looks beautiful! This is SO cute! 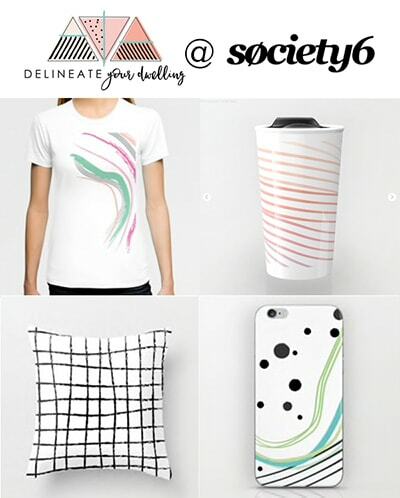 I love the colors and patterns you chose for this. Congrats on being a part of 12 Months of Martha! Can’t wait to see next month’s project! Aw, thanks Erica!! I’ve been wanting to give tribal patterns a try and now I’m hooked! I absolutely love this cool clutch SO much!!!! Aw, thanks Tanya! It was a fun one to create! !